On Friday, Feb. 1, after the NY Knicks first game since their blockbuster trade, Head Coach David Fizdale made it clear that he fully understands the benefits of having their NBA G League affiliate the Westchester Knicks located close by in Westchester County. “We communicate a lot back-and-forth and anytime we are in the same town, they are in our practices coaching and helping us. So am I am not surprised about those guys having success because they have been working at the same stuff as our big team,” stated Fizdale. The trade heard around the world sent the NY Knicks supposedly hope for the future Kristaps Porzingis, leading scorer Tim Hardaway, Jr., Trey Burke and Courtney Lee to the Dallas Mavericks for point guard Dennis Smith, Jr. center DeAndre Jordan, guard/forward Wesley Matthews and two future First-Round Draft picks. The seemingly impromptu deal caught fans, media and even NBA insiders by surprise, on Thursday, Jan. 31. But more importantly, it left Fizdale short potent manpower for the Knicks game the next day against the Boston Celtics. The trade was official immediately, ushering Hardaway, Burke, Lee and the injured Porzingis out of the Madison Square Garden door, while welcoming Smith, Jordan and Matthews into the “World’s Most Famous Arena” but unprepared to suit-up. On Friday, when the Knicks starting line-up was introduced at MSG, it included center Luke Kornet, who signed a NBA G League Two-Way player contract with NY Knicks in 2017. Kornet spent a lot of time honing his skills assigned to the Westchester Knicks last season. This year Kornet signed a one-year NBA contract with the NY Knicks. The starting five also included Damyean Dotson, who sent much of last season assigned to the Westchester Knicks but joined the NY Knicks roster at the end of last season and has cemented himself as a viable asset to the NBA Knicks. Dotson scored 22 points and grabbed six rebounds against Boston. 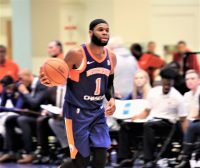 Also, with Emmanuel Mudiay injured, Kadeem Allen, who signed a Two-Way contract with the NY Knicks on Jan. 14, the day before his 26th birthday, assumed the position of starting point guard. Allen became the eighth player in Westchester Knicks history to earn a Call-up when he joined the NBA affiliate Knicks on Jan. 28. “I really was not thinking about being called-up because I knew my time would come. I was just playing basketball and eventually God blessed me to be in this position and I am taking advantage of my opportunity,” said Allen. Furthermore, Two-Way player Isaiah Hicks is also well known at the Westchester County Center and Allonzo Trier, who became the first Two-Way player to sign an NBA contract within the first two months, came off the bench for Fizdale, against Boston. “Coach (Mike) Miller has done a heck of a job developing these guys. We really try to have a seamless flow between our G League team and our team. 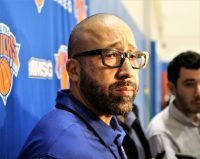 We try to run the same stuff, use the same system, the same terminology and the same levels of accountability,” explained Fizdale. So the NY Knicks surprised the world and traded Porzingis, who if he remains healthy will certainly be some NBA team’s superstar in the near future. The Knicks blew-up the team once again, as the organization did under different management in 2011, when they traded, Danilio Gallinari, Wilson Chandler, Raymond Felton and Timofey Mosgov to the Denver Nuggets to attain Carmelo Anthony and Chauncey Billups. However, this time they have created about $72 million in salary cap space. I sure hope the gamble pays off in the lucrative free agent market this offseason and brings more than three consecutive Playoff appearances with only one playoff series win and one Atlantic Division title, as was the results of the 2011 trades. As the NY Knicks start over again this season, there is more than enough “space” to bring a NBA Championship to “The World’s Most Famous Arena” by 2021.